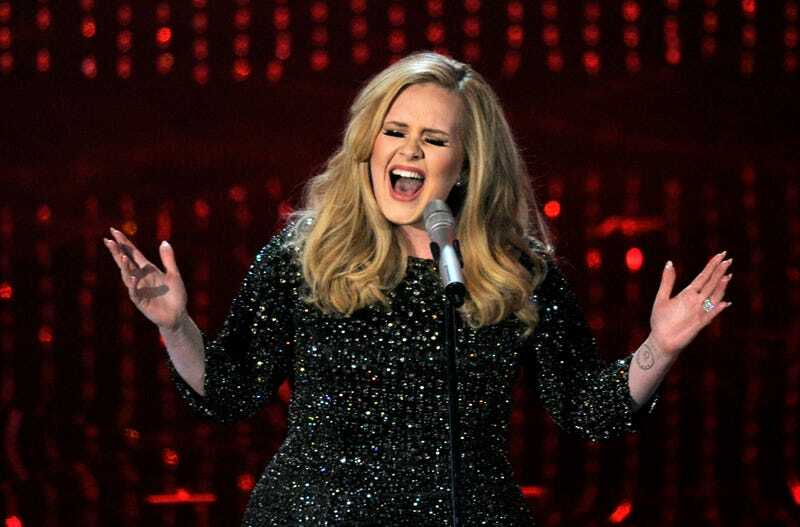 A new Adele album is nigh! Probably! Maybe? The World Music Awards Twitter account confirmed both a new Adele album, 25, and a tour yesterday, although no word yet from the British singer herself. 25 would be a follow up to her absurdly successful 21, which has spent 176 weeks on the Billboard 200 chart, selling 30 million copies worldwide. I love me some Adele, so I'm interested to see how much her sound or lyrical content has changed. She's no longer the the young diva she was on 19 or the heartbroken powerhouse from 21. Adele is now a mother in a seemingly stable relationship. Will the heartbroken souls of the world be given another ballad to sing along to as they cry into their favorite comfort foods? Or will we all have to work through our feelings as we adjust to the era of Happy Adele and her soulful, jaunty tunes? While I have no idea what Happy Adele will sound like, here's hoping it leads to more adorably funny acceptable speeches.